Mahindra’s idea of a micro SUV received mixed reviews upon its launch. The car’s eccentric design had a ‘love or hate’ relationship with the customers. 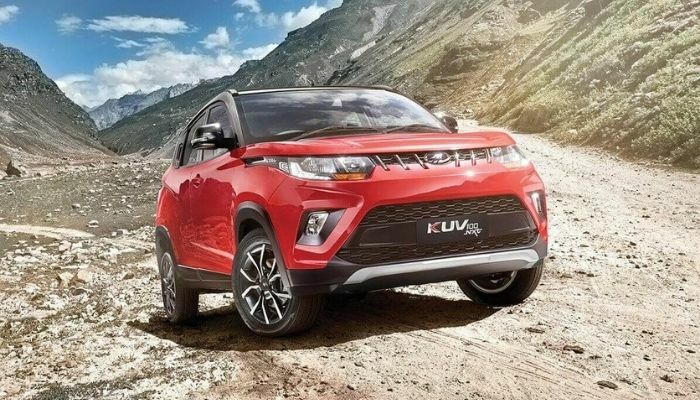 Over the years the plethora of features offered in this micro-SUV, the added practicality of the SUV design and aggressive pricing of its lower variants managed to procure KUV 100 a substantial and loyal customer base. The pricing for the base model of KUV 100 starts at Rs. 4.51 lakh (ex-showroom). The micro-SUV is sold in a total of 18 variants – 9 diesel and 9 petrol models. The price for diesel base model starts at roughly Rs. 1 Lakh at Rs. 5.52 lakh (ex-showroom). KUV 100 has unconventional proportions but may also come off as quirky. There is a large air-dam upfront which has been integrated into the front bumper along with fog lamps. The bumper sits over a faux skid plate. Headlamps get a swooped back design and incorporate KUV 100 logos. KUV 100 comes with a raked roofline and is offered in a dual tone colour scheme. At the rear, we get an integrated spoiler and the car rides on 15-inch Dimond cut alloys. Mahindra’s micro-SUV is one of the most compact offerings in the segment and thanks to its tall body design, there is plenty of cabin space. The compact dimensions of the car mean that it will be easy to maneuverer around the city and offer a more manageable turning radius. 170 mm if ground clearance is ample to take on the urban road conditions. KUV100 is offered in a 6-seater layout as standard. There is also an option of a made-to-order 5-seater. The extra seat adds to the practicality of the micro-SUV. The gearstick has been integrated into the centre console. Also available is a three-spoke steering wheel which comes with mounted telephony controls. Mahindra offers two 1.2 litre mills in both of its petrol and diesel variants. The petrol unit comes will an all-aluminium block and produces 83PS of power and 115Nm of torque. The much torquier diesel motor comes with a peak torque output of 190Nm and 77bhp of power output. The engines bestow admirable amount of grunt, but it is not instantaneous. The noise reduction in both cases is not up to the mark. The petrol variants of KUV 100 offer an ARAI certified fuel economy of 18.1 kmpl and the fuel economy of the diesel models stand at 25.32 kmpl. Steering mounted controls, digital MID screen, LED DRLs, chilled glovebox, touchscreen infotainment systems and automatic climate controls are some of the creature comforts that KUV 100’s variants are available with. The infotainment system comes with built-in navigation and Mahindra BlueSense app. A micro-hybrid system is also offered to improve the fuel economy of the micro SUV. Safety features like a rear view camera, ABS with EBD, dual- front airbags, speed sensing auto-door locks, Anti-theft alarm and automatic hazard lights are on offer. KUV 100 is also offered in dual-tone colour schemes and is available in seven different colours – Fiery Orange, Flamboyant Red, Dazzling Silver, Aquamarine, Pearl White, Designer Grey and Midnight Black.